The Flyer is the U-shaped part on a spinning wheel. It sits between two bearings and should spin freely. At one end is the orifice through which the yarn that is being spun can be threaded to get to the bobbin. The bobbin sits on the flyer shaft and should spin freely. 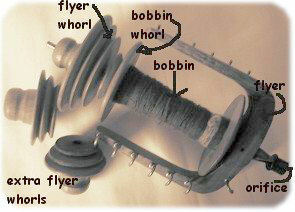 At the far end of the bobbin a pulley is formed called the bobbin whorl. Finally, after the bobbin, a second pulley, the flyer whorl is screwed, or otherwise fixed to the flyer axle. This frequently has a wrong handed thread, ie you turn the whorl clockwise to remove it. Alternatively, the whorl may be held on the axle with a square cut section. There may be several different diameter grooves cut into this whorl. Put a drive band on a double drive wheel. A doubled band goes around the drive wheel and one turn goes round each pulley, so that when the wheel is turned, the flyer and bobbin spin at different speeds. The spinning of the flyer twists the loose fibre into yarn, and the speed difference pulls the fibre through the orifice and winds it onto the bobbin. The smaller the flyer whorl (and the bigger the spinning wheel), the faster the flyer will turn and the more tightly the yarn is twisted. The larger the difference in size between the two whorls, the stronger the pull on the loose fibre, and the faster it will be wound onto the bobbin. This means that wheels designed to spin very fine yarn will have small pulleys which nearly the same diameter (lots of twist, not much pull). Heavy yarns with low twist need a larger flyer whorl and smaller bobbin whorl.